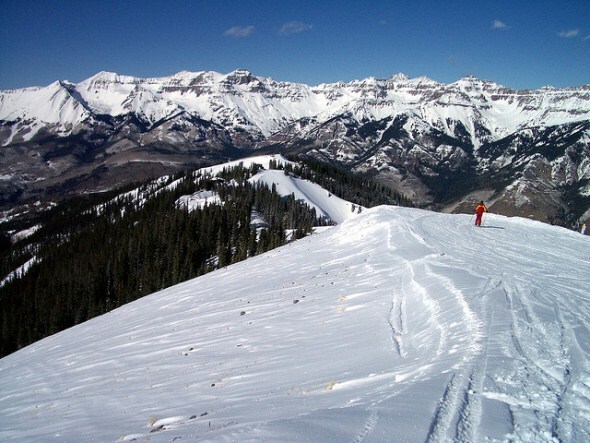 The Telluride Ski Resort is located in the mountains just south of the town and offers more than 2,000 acres of skiable terrain that are relatively uncrowded by Colorado standards. The base is in Telluride at 8,725 feet, and lifts run as high as 12,570 feet, though ambitious skiers can hike two hours to the top of Palmyra Peak at 13,150 feet. The resort offers 125 runs that serve all levels of skiers (23 percent beginner, 36 percent intermediate and 41 percent expert) and offer a mix of groomed and mogul runs. There are two gondolas and 16 other lifts that can carry as many as 22,386 skiers an hour. The mountain averages 309 inches of show and about 300 days of sunshine each year, with a ski season that begins at Thanksgiving and runs into early April. Favorite downhill runs include The Plunge with a 3,140-foot drop from the mountain into Telluride for experts, the nearly 3-mile-long See Forever for intermediates, and the 4.6-mile Galloping Goose for beginners. The Air Garden Terrain Park is the Southwest’s largest, covering more than 13 acres with a mix of berms, banks, jumps, and tabletops, plus a 12-foot competition-size halfpipe. There are terrain parks for beginners, intermediates, and experts. The ski area can be reached from the historic town via a gondola and two chairlifts, and there is a modern Mountain Village (founded in 1987) at the foot of the main skiing area. The two towns are connected by a free gondola – the only transportation system of its kind in North America. The ride takes just 13 minutes and eliminates the eight-mile, 20-minute drive between Telluride and the Mountain Village.